The Democratic primary for Texas' 21st Congressional District has put on display a growing debate over whether the party should court disaffected Republicans this year, focus on getting their revved-up base to the polls or do some of both. JOHNSON CITY — Sitting inside a Mexican breakfast spot in this Hill Country town, a flat-screen TV above him flashing CNN’s coverage of President Donald Trump, Democrat Joseph Kopser spoke of tribalism. “One of the problems we have in the United States right now is everybody’s divided into tribes. Everybody reverts to their tribes. Take any issue — whether it’s gun control or immigration — everybody’s in their tribes,” said Kopser, who was at his first stop on a two-day tour of all 10 counties in Texas' 21st Congressional District, where U.S. Rep. Lamar Smith, R-San Antonio, is retiring. The traditionally Republican stronghold — which has drawn 18 GOP primary candidates — stretches from Austin to San Antonio and spreads out into the Hill Country. Kopser's talk of tribalism was a bipartisan-flavored message that drew knowing nods from the small coffee group that let him join its table Saturday morning — and it is one that could theoretically prove fruitful in a general election. But first Kopser has to win the Tuesday primary, and for Texas Democrats, the race to replace Smith epitomizes the conundrum they face as they look to seize the opportunities created by Trump: Should they nominate someone who can win over disaffected Republicans or someone who can turn out their energized base? Or can they have it both ways? Among Kopser’s three primary opponents — fellow Austinites Derrick Crowe, Elliott McFadden and Mary Wilson — there is little appetite to actively court the other side. Kopser, an Army veteran and tech entrepreneur, and his campaign are well aware of the debate. At his second stop of the day — a wedding venue on the dirt-road outskirts of Fredericksburg — not a minute passed after Kopser began speaking before he offered an unprompted rebuttal of his rivals’ contention that the election can be won exclusively with Democrats, arguing the "math doesn't support it" and it runs contrary to his coalition-building persona anyway. The point was echoed before the stop by Joe Trippi, a veteran Democratic strategist working for Kopser. Kopser’s primary competitors instead see a path to victory by turning out the Democrats in the district who typically vote in presidential elections but not midterms. It is in those presidential years where the shifting political winds of TX-21 have been evident — Republican nominee Mitt Romney carried the district by 22 percentage points in 2012, while Trump won it by less than half that margin in 2016. Kopser’s strategy has made him a frequent target of Crowe and McFadden, the CEO of Austin B-cycle and a former executive director of the Travis County Democratic Party. They have sharply questioned Kopser’s progressive credentials, pointing to everything from his Republican roots — he says he grew up as a Republican in the 1980s — to his board position with the Texas Association of Business, which largely supports GOP candidates and causes. Kopser has sought to use his TAB experience to his advantage, arguing he has helped push the organization in the right direction on some issues — including in its opposition to the “bathroom bill” last year at the Capitol. The primary began as a race to challenge Smith, whose climate change skepticism made him a galvanizing target for Democrats. Kopser stood out in the primary field back then, outraising Smith — the chairman of the House Space, Science and Technology Committee — for two straight quarters. But the primary took an unexpected turn in November, when Smith announced he would not seek re-election, giving way to the first open-seat race in the district in over three decades. Days later, the Democratic Congressional Campaign Committee expanded its target list in Texas — it already had three districts on it — to include TX-21, encouraged by polling before Smith’s retirement that showed a generic Democrat trailing a generic Republican by single digits there. But there was at least one other reason: National Democrats saw Kopser as fitting the mold for the kind of candidate they believe can win traditionally GOP districts in 2018. Before the end of the year, Kopser got the endorsement of Steny Hoyer, the U.S. House minority whip and the No. 2 Democrat in the lower chamber. He raised $261,000 in the fourth quarter of 2018 — far more than any of this primary opponents and a remarkable sum for a Democrat running for a seat that was on few people’s radar just a year ago. Kopser’s primary rivals got the message. Since the primary became an open-seat race, it has only grown more spirited, drawing a number of local party leaders off the sidelines. Kopser won the endorsements of Bexar County Judge Nelson Wolff, state Sen. Kirk Watson of Austin and state Rep. Donna Howard of Austin. Travis County Judge Sarah Eckhardt has given her support to both Crowe and McFadden, who also has the backing of state Rep. Eddie Rodriguez of Austin. In addition, Crowe has received the backing of state and national groups aligned with U.S. Sen. Bernie Sanders, I-Vt. — including Our Revolution, the organization that grew out of his 2016 presidential campaign. 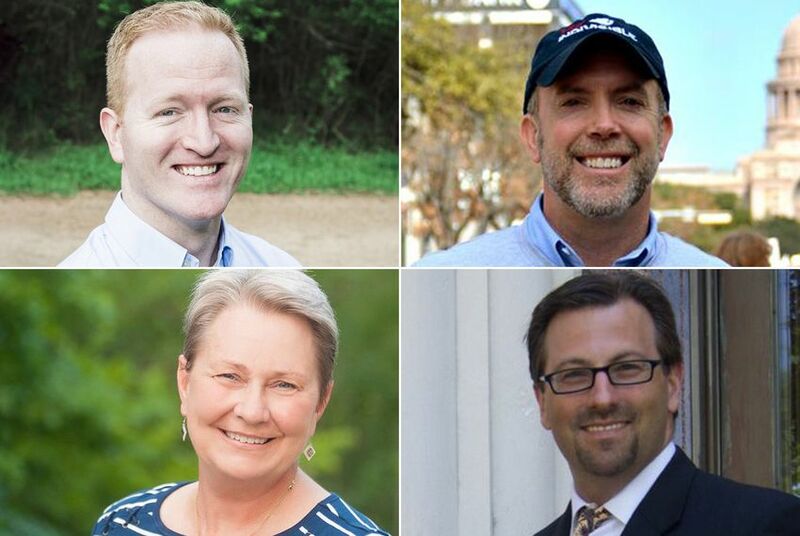 As the Democrats duke it out, the 18 Republicans are jockeying for a place in an all-but-certain runoff. Kopser and his rivals have been keeping an eye on the candidates as they size up the potential landscape in the general election. "Eighteen Republicans — there’s only two that sound halfway moderate, and the rest are every flavor of the Republican civil war of today," Kopser said in Fredericksburg. Meanwhile, the debate rages over whether the Democratic path to victory in TX-21 should include GOP support. Wilson, a minister and mathematician, said in an interview that she was trying to find something of a third way in the debate. "I don’t feel a need to go court Republican votes by sounding like I’m sort of Republican to them," she said. "I don’t need to court votes by doing anything other than being who I am."